Spokane Municipal Court Judge Mary Logan presides over the new community court, which is held weekly at the downtown library. On the brightly lit first floor of the downtown Spokane library, Robert St. John, bald and bundled in layers, sits quietly on a bench, staring at the floor and eating a brown-bag lunch: a cellophane-wrapped sandwich and a bottle of yellow Gatorade. Even with his lengthy criminal record, this may be the first time St. John, 43, has ever been served lunch for showing up to court. He's here on two counts: trespassing under the freeway and stealing a $28 bottle of Black Velvet from Rosauers. He says he needs stability, counseling and help with his alcohol problem. Here, instead of jail time, he might get it. Past a makeshift security setup and a wall of public art is the city's latest experiment in criminal justice. Run by a collection of court and law enforcement leaders, the Spokane Community Court, which debuted early this month, offers nonviolent offenders who commit misdemeanors downtown an alternative to the traditional path. Instead of appearing before a judge at the courthouse and facing potential jail time, they can attend court at the library, where they're also given a needs assessment and connected with service providers. Affordable Care Act navigators and representatives from groups like Goodwill and SNAP are here, and in an effort to address one of the major barriers to employment and housing — a lack of ID — the department of licensing will be on site once a month. St. John spent the morning in a library conference room talking with service providers, like those at Frontier Behavioral Health, who he hopes can help him get the medication and counseling he says he needs for anxiety and paranoid schizophrenia. Now he's waiting to enter the room next door, to agree to a deal that will get his charges dismissed if he gets that help, stays out of trouble and does community service. "This is the first time they've ever tried to work with me," St. John says. "It's a blessing." The court is at once a way to address so-called "quality of life" crimes that have plagued downtown's reputation and a chance to test alternative principles gaining traction locally and around the country. Jail spending is on the rise; evidence that jailing nonviolent offenders reduces their likelihood to reoffend is hard to come by. Locally, the recent report from the Regional Criminal Justice Commission has called on Spokane to find more alternatives to incarceration. "We want to remove barriers for them to progress forward," says presiding Judge Mary Logan, who led the effort to start the court. "If I can effectuate change for one person and another person, that can turn into a group and that can turn into a community." When St. John appears before Logan, the city prosecutor working his case is one who has in the past recommended jail time for him. But the prosecutor, Adam Papini, and St. John's public defender have already worked out a deal to offer him services and 16 hours of community service instead. "I saw him in a different light in community court. He has needs that need to be addressed. I recognize those now," Papini says later. "There was a time when I measured my success on jail time. I recognize [now] we're all human and we need to be recognized as human. It's easier to jail someone if I see them in a light that's less human." A lack of buy-in from a prosecutor, among other members of the system — police, probation, service providers — can doom a specialty court. That all those players are working together here sets Spokane's apart, says Brett Taylor with the New York-based Center for Court Innovation, which has helped Spokane and other cities build community courts. "When you start to challenge people to change the way they practice, you can get a little pushback," Taylor says. "You're taking me outside my comfort zone. You're subtly saying you don't think I do things right now, and I need to change." Police involvement can be especially critical because officers are often the ones directing nonviolent offenders they cite on the street to community court. At a debriefing meeting after the first day of community court, Assistant Spokane Police Chief Craig Meidl told organizers he'd develop a training procedure to make sure officers know to recommend community court to nonviolent offenders they cite downtown. "You guys are taking that extra step," Taylor told the team. "You're ahead of the curve." 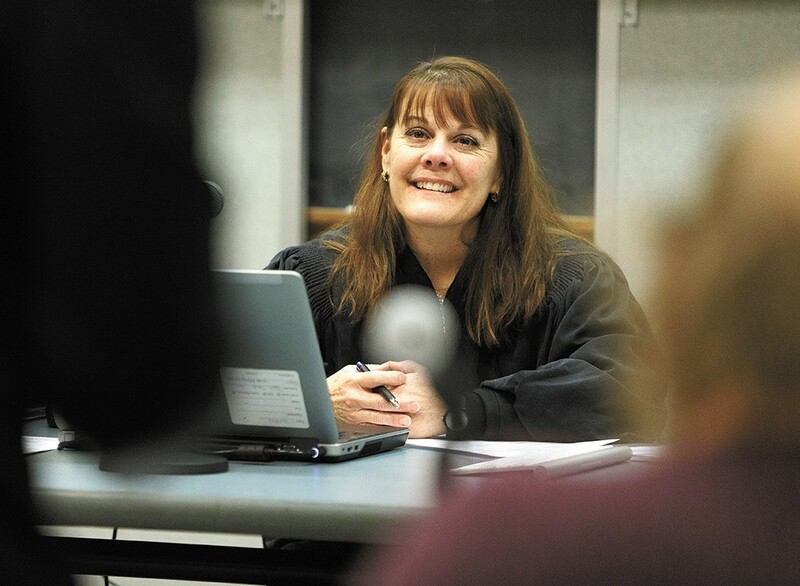 As community courts gain popularity across the nation, success stories are common. Among them is the 13-year-old Red Hook Community Justice Center in Brooklyn, where a recent study showed adult participants were 10 percent less likely to commit new crimes after going through the court and juveniles were 20 percent less likely. Even more tangible: taxpayers saved $4,756 per defendant in avoided victimization and the court saved the city nearly $7 million total. But those kinds of results take years, and that's making those behind Spokane's Community Court anxious about patience. "We can't solve all of the problems of the homeless population in three months," Logan says. "That's a ridiculous expectation and no one should have that." Washington State University's Jacqueline van Wormer, a professor and researcher with extensive experience evaluating specialty courts, will track the court's progress. After a few years, van Wormer hopes to have long-term results to study, but she'll start now by measuring three short-term effects, comparing a set of offenders who went through the traditional system to a group who participated in community court: Are those in community court completing more community service? Are they engaging with more social services and completing whatever services are recommended for them? Are they reoffending less — or at least less quickly? Communities naturally want less recidivism, fewer people returning to the system at all, van Wormer says. But with a complex population battling mental health or trauma issues on top of a lack of basic needs, like housing, she says the city should view even a slower return to crime as a success. "The bottom line," van Wormer says, "is that we get a better return as a taxpayer to really try to address the underlying needs of these individuals, rather than just strict incarceration." Grateful for the broad range of support the program is seeing, Logan is careful to say she's received no pushback to the idea of bringing the community court model to Spokane. But the Downtown Spokane Partnership is watching the court closely. DSP President Mark Richard says he's behind the idea philosophically, but members of the group, which represents businesses in the downtown core, are worried its location at the library could hurt business. Instead, he says, the group believes the city council chambers at City Hall could be a better option. "The sense amongst my board is that [City Hall] just might be more conducive to that particular governmental function ... and not be, if you will, at the front door or the side door connected through a skywalk, with no restrictions into River Park Square and those kinds of things," Richard says. But the library also has unique benefits: It's a neutral ground, both for the criminal justice representatives and for offenders. It's warm and it offers connections to programs like WorkSource, which helps the unemployed find jobs. Plus, as Logan says, unlike traditional court, it's not "two steps from jail." A week after his first appearance, St. John comes before the judge in the makeshift conference room courtroom again. He's supposed to have eight hours of community service completed, but after a hospitalization and loss of his medications, he hasn't done any of it. Logan, Papini and St. John's public defender, Francis Adewale, all say they understand and ask him to try again this week. It's not perfect, they know, but with a transient population, it's an accomplishment just to see someone again.